The presidents of the United States and China are destined to clash, precisely because their economic worldviews are so similar. Xi, who has staked his identity and regime upon projecting China as a great power on the same level as the United States and returning it to global prominence, had broader objectives in mind. In their joint press conference, Xi talked about “promoting coordination and cooperation among major countries” to demonstrate to his domestic audience he treated Trump as an equal. But his talk about cooperation did little to obscure the underlying conflict between Trump and Xi — a conflict that stems from their fundamental similarities rather than their superficial differences. Trump the brash-talking reality TV star and real estate mogul and Xi the guarded, re-educated party leader seem to share little in common. But they have fundamentally similar geopolitical – and, more specifically, geo-economic — worldviews. Trump and Xi are both strident nationalists. Trump’s infamous “Make America Great Again” catch phrase strikes the same chord as Xi’s sloganeering promotion “national rejuvenation” or the “Chinese dream.” Both romanticize historical eras when they their countries commanded more respect or power. Their visions of these periods may never have existed or censor out key historical details, but they both want to return to hazy replication of previous glories. Nationalism informs their other agendas and how they pursue their goals. Flowing from their nationalist mindsets, Trump and Xi view the economic world in mercantilist terms. Trump prioritizes addressing the chronic U.S. trade deficit in the mistaken belief this is a sign of economic weakness and that surpluses equal strength. Xi prioritizes maintaining closed Chinese markets while prying open international markets to drive the trade surplus required by the capital accumulation model of economic growth. Their latent nationalist mercantilism informs how and what objectives each pursues. Economic negotiations are seen as zero-sum games rather than attempts to expand the range and level of opportunities. Any agreement to open up markets implies a national weakness that may exacerbate the measure of national strength through the trade surplus. This approach narrows opportunity for agreement between countries. Beyond how Xi and Trump negotiate, mercantilism decides what they will negotiate. Gone are the days of negotiating sweeping, fundamentally revolutionary agreements, with the leaders instead focusing on transactional bargaining that accomplishes no larger goal. In the spring, Trump and Xi announced a 10-point agreement on narrowly focused issues such as U.S. beef exports and Chinese bank investigations in the United States. Described as a “herculean” effort, this agreement contained no larger objectives remaining purely transactional. Market access issues were similarly absent from the recent package of deals. Even China’s announcement that it will allow foreigners to own Chinese banks seems like an attempt to persuade foreigners to bail out an increasingly shaky financial system rather than a principled shift in market access. Negotiation between the two major global powers focuses on specific transactions rather than advancing broad principles. This shift bears significant consequences for the state of the bilateral economic relationship. Despite Trump’s focus on addressing the trade deficit with China, it is simply an impossibility to arrest a $350 billion deficit via individual transactions negotiated by the president. Absent a broader agreement, either on a bilateral basis or, preferably, a multilateral one, transactional negotiation will fail to prevent an expansion of the trade deficit worsening Chinese-U.S. economic relations. It also further entrenches Chinese interests in an illiberal world order. For all the hand-wringing over Trump’s isolationist rhetoric, the world has feted Chairman Xi’s closing of Chinese markets and nationalist industrial policies. The longer Trump focuses on transactional negotiations rather than principles, the more entrenched illiberal Chinese market practices will take hold and dominate. Perversely, Trump attempting to reduce the U.S.-China trade deficit one transaction at a time is further entrenching the illiberal market practices China holds at home and projects abroad. Economic duress can be the harbinger of political change – and sometimes geopolitical change. Think about the United States in the 1930s, or the Soviet Union in the 1980s, or the European Union any time in the past decade. In these instances and many others, leaders’ options for righting the economy were only as palatable as the political consequences they would incur. A case in point is the United States today. Like so many other countries, the U.S. is still coping with the social and economic fallout wrought by the 2008 financial crisis. The crisis may not have created Washington’s economic problems, but neither did it resolve them. And as those wounds continue to fester, it appears as though the U.S. is headed for recession. Evidence to that effect is the flattening of the yield curve for U.S. Treasuries – a curve that is the flattest it’s been in 10 years. Usually, long-term debt has a higher interest rate to compensate investors for tying their capital up for longer. Declining interest rates on long-term debt, or higher rates on short-term debt, result in a narrower spread in the yield curve. (Visually, this looks like it is becoming flat.) The rare occurrence of an inverted yield curve – when short-term rates are higher than long-term rates – has on several occasions heralded a recession. A yield curve can flatten or become inverted in two ways: through higher short-term interest rates and through lower long-term ones. Both are now occurring at the same time. Since the 2008 recession, the Federal Reserve has maintained low interest rates, prompting investors to “search for yield.” In other words, they searched for higher returns in riskier investments. Investors are now flocking to long-term treasuries to reduce risk, a sign that they believe the economy will fare poorly in the future. After 2008, when the Fed lowered interest rates, stocks and “junk bonds” – bonds with a low credit rating and higher interest rates – were purchased in greater numbers. Investors have since begun to sell stocks and junk bonds in exchange for more secure assets. CalPERS, the United States’ largest pension fund, which manages nearly $350 billion in assets, is reducing its exposure to stocks and overweighting high-rated debt. Similarly, capital from debt investment funds has begun to flow out of those in the high-risk category and into more secure ones. The other way that a yield curve can flatten – higher short-term interest rates – is driven by monetary policy. The Fed has begun to raise rates, thanks in part to low unemployment, though inflation has remained below its target of 2 percent. The Fed typically adjusts its rates based on employment and inflation metrics. Too much inflation is dangerous because it lowers the value of money, but too little inflation is also dangerous because it can create unsustainably high levels of debt. Otherwise it can send an economy into a deflationary spiral, whereby prices constantly decrease and therefore discourage consumer spending. Rising interest rates in a low-inflation environment increase the risk of such a spiral. Investors and the Fed are concerned that low inflation will play its part to suppress economic growth. The causes of this peculiar brand of low inflation, however, tell us something deeper about the U.S. demography. Inflation is simply a measurement of price increases. The Consumer Price Index is frequently cited to determine inflation. It stands to reason, then, that if inflation is low, consumer spending is also low. This is in fact the case. Since the end of the 2008 recession, consumption expenditure growth – which tends to be a leading indicator of inflation, albeit a slight one – has generally stayed within a range of -1.5 percent to 2 percent. Consumer spending growth since 1980, on the other hand, rarely dipped below 0 percent and generally stayed between 2 percent and 4 percent. Why is consumer spending – and therefore inflation – so low if the U.S. unemployment rate is likewise so low at roughly 4 percent? Shouldn’t employed people be spending money, and therefore driving higher inflation? The answer to that question lies both in the size of the labor force and the quality of the jobs that people are finding. The unemployment rate, generically understood as the percentage of people without jobs, is a useful but sometimes misleading metric. It only calculates employed people as a percent of the labor force. It excludes people not actively searching for jobs (as determined by a number of criteria). This means that the unemployment rate can fall even as people leave the labor force. Participation in the labor force declined over the past decade, from 66 percent to 62.7 percent, which some have attributed to the retirement of baby boomers. This is only partly true. The labor force participation rate for workers in their “prime” years – 25 to 54 years – declined from 83.3 percent in 2008 to 81.6 percent today. In fact, the participation rate for workers of all ages declined over the past decade except for those over 55 years of age. While the increase in the participation rate for those over 55 may seem counterintuitive – given that they are the retiring baby boomers – participation rates for those over 55 and 65 are much lower than for younger workers. Further, retiring baby boomers make up a larger portion of the population than they did a decade ago, so you can actually have an increasing participation rate in older categories with fewer actual workers in the market. The result is a shrinking labor force, and slow growth in consumption expenditure. Taken together, these two metrics suggest that people have jobs – just perhaps not ones that can cover their living expenses. The flattening yield curve, therefore, illustrates what’s going on in the economy. Low inflation – the indicator that both debt investors and the Fed fixate on – stems from mild consumption growth, caused by a declining prime-age labor force and an inability of those in the labor force to secure adequate wages. Lower long-term interest rates, combined with the Fed increasing rates, are signs that the U.S. economy is heading for a recession. Though that recession may not be as bad as the 2008 recession, the inherent social divisions aggravated by the 2008 recession are still here. A recession that makes life more difficult for those who have suffered for the past decade – but not for the elite – is inherently political. The price of bitcoin topped $15,000 for the first time on Thursday, in a fresh rally that is hitting new highs every day. 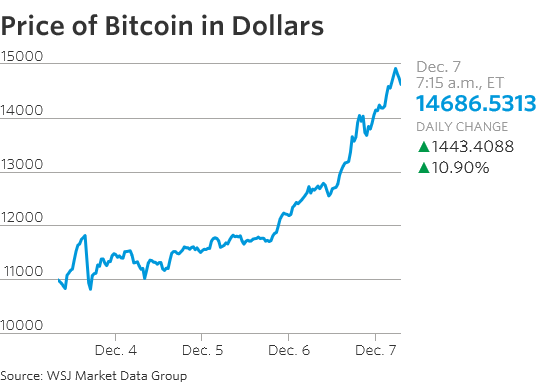 Bitcoin crossed the latest milestone Thursday morning just shy of 6 a.m. New York time. It hit a recent high of $15,058 a few minutes later, according to research site CoinDesk, coming only hours after it topped $14,000 for the first time. It recently traded at around $14,800. Bitcoin’s gains this year have accelerated recently, rising more than 40% in the past week alone. The rally has attracted new investors around the world as excitement mounts about the potential for digital currencies. “Bitcoin and cryptocurrencies are something exciting, something new, and people want to be part of the story,” said Cedric Jeanson, a former JPMorgan Chase & Co. trader who has since started BitSpread Ltd., a bitcoin-focused hedge fund. “You’re seeing everyone seize the opportunity” and that’s driving the price higher, he said. The price of the digital currency has soared, but experts say you should be wary. The latest surge comes despite the theft of nearly $70 million worth of bitcoin from a cryptocurrency-mining service called NiceHash following a security breach, causing the company to halt operations for at least 24 hours. But even the hack didn’t do much to halt the rally’s momentum. Bitcoin crossed $13,000 on Wednesday, just hours after breaching $12,000 for the first time and a week after it first broke above $11,000. Bitcoin has rallied more than 1,400% so far this year. Bitcoin’s rise has attracted crowds of eager small-time investors who are piling in, a contrast from when the digital currency was created nearly decade ago and had originally been just a curiosity for techies. Now, cryptocurrencies are expected to see more interest from institutional investors. Three exchanges in the U.S. are set to offer futures contracts on bitcoin, including CME Group and Cboe Global Markets, which are poised to launch futures contracts later this month. The launches are considered another step toward building a traditional market around the stateless digital currency. The difference between short-dated and longer-dated US Treasury yields has narrowed at its fastest pace since 2008, as investors anticipate a quicker rate of policy tightening from the Federal Reserve next year. The difference between two- and 10-year yields has fallen 33 basis points to just 52 basis points over the past 30 days, while the difference between five- and 30-year yields has fallen 34 basis points, surpassing declines prompted by the European sovereign debt crisis in 2011 and reaching a pace last seen during the financial crisis, according to analysts at Citi. It marks a pronounced “flattening” of the yield curve, with investors receiving decreasing returns for holding longer-dated bonds compared to shorter-dated notes — typically a harbinger of economic recession. But some investors and analysts say the driving forces for the current move are different. Heightened expectations for the passage of tax reform into law could offer a short-term boost to the economy, but were unlikely to trigger a long-term boost to inflation that would drive longer-dated yields higher, said Ian Lyngen, head of US interest rate strategy at BMO Capital Markets. “It’s pretty straightforward. It will keep the Fed on path to keep normalising but it won’t trigger the kind of stimulus that might introduce more significant inflation,” he said. The probability that the Fed will increase the target Fed funds rate when it meets in December have hit 98.3 per cent as implied by the markets, up from 87.5 per cent the day after the Fed last met at the beginning of November. Increasing expectations of interest rate rises from the Fed have helped drive the more policy-sensitive two-year Treasury yield up 54 basis points since early September to 1.80 per cent this week. In contrast the 10-year note yield has remained stuck between 2.30 per cent and 2.46 per cent since mid-October and on Wednesday was around 2.33 per cent. Mr Lyngen also pointed to the Senate’s inclusion of the alternative minimum tax — a baseline, parallel tax assessment that permits fewer deductions — as damping the stimulative effect of tax reform. It may still be removed as the House and Senate seek to align their proposals but analysts say its inclusion would provide a floor to the benefit received by companies, with effective tax rates already below the statutory 35 per cent. Market gauges of investors’ inflation expectations have remained muted since the passage of the Senate’s tax proposal. The 10-year break-even inflation rate edged slightly lower on Tuesday to 1.88 per cent. Analysts also point to strong demand for longer-dated bonds as another factor weighing on yields. Foreign investors have been big buyers of Treasuries this year, attracted to the higher-yielding asset compared to high-quality government debt elsewhere across the globe. Domestically, traders say pension funds have been driving recent demand. “That is going to continue to put pressure on the yield curve to flatten,” said Andrew Brenner at National Alliance. Taxing endowments’ investment income would help higher ed. Whatever you may hear, the Republican tax-reform proposal isn’t an assault on higher education. The House and Senate plans include a new 1.4% excise tax on the net investment income of university endowments, but the levy applies only to private colleges with at least 500 students and endowments of more than $250,000 a student. Schools like Harvard, Yale, Stanford and Princeton—which together hold over $100 billion—are predicting doom. Yet this long-overdue tax will benefit higher education in the end. Over the past 30 years universities have chased higher returns on their endowments, leading them to take greater risks. Our research shows that more than 75% of the assets in university endowments are now in risky investments: equities, hedge funds and private equity. 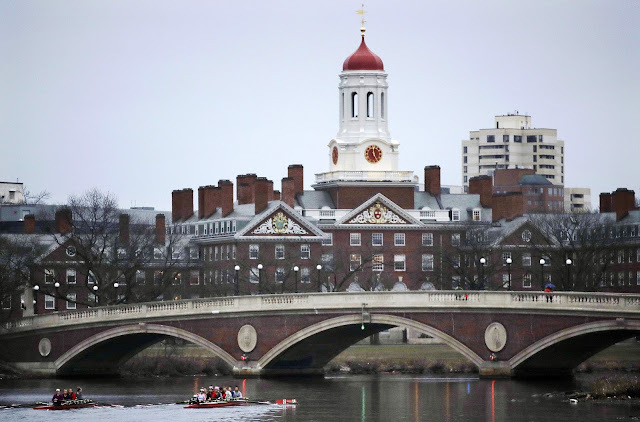 Think of Harvard as a tax-free hedge fund that happens to have a university. The proposed levy on investment income—dividends, interest and capital gains—is fundamentally a tax on this risk-taking, not on the endowments themselves. By taxing risk-driven income, the GOP plan doesn’t target higher education. It goes after hedge funds masquerading as university endowments. When an endowment is invested in safe assets such as bonds, it serves as a rainy-day fund to buffer the risks a university takes in its normal operations: admitting students on scholarship, launching new research laboratories and generally expanding its educational and research missions. Such a safe endowment generates almost no investment income, meaning there would be no tax liability under the GOP proposal. Instead the tax would fall on large, risky and illiquid funds. Endowments that make such investment decisions cannot effectively protect their schools. During the financial crisis, Harvard’s endowment lost nearly 30% of its value. After failing to sell its private-equity portfolio, the university had to institute drastic hiring and budget freezes. A large and risky endowment also reveals a university’s poor assessment of its internal investment opportunities, such as scholarships and research. If Harvard and Stanford have educational and research projects that could benefit from additional funds, why put their money at risk in the stock market? Perhaps the answer is that the opportunity to run a tax-free hedge fund is too attractive. In that case, why should taxpayers subsidize their activities? In colleges’ defense, states have placed perverse restrictions on their ability to use endowments as rainy-day funds. The Uniform Prudent Management of Institutional Funds Act is a law in 49 states that limits the maximum endowment payout rate between 5% and 7% a year. Although well-intentioned, that and earlier restrictions prevent universities from tapping endowments to fill the kind of budget holes they experienced in 2008. To have the best chance of improving incentives for endowments, the proposed investment tax should be accompanied by a repeal of these payout caps. But it’s a mistake to think that taxing risky investments by university endowments is an attack on academia. Discouraging superwealthy schools from pumping cash into stocks, hedge funds and private equity should lead to increased spending on education and research. Isn’t that the purpose of higher education? Messrs. Gilbert and Hrdlicka are assistant professors of finance at the University of Washington. Throughout history, every great power has had money that’s recognized around the world. Usually, these currencies have been tied to gold and silver. 1. Immediately convert the yuan they receive from selling oil into physical gold at the spot price for immediate delivery. 2. Or, lock in the gold to be delivered at a future date for a fixed yuan price with a gold futures contract. This eliminates any uncertainty because of fluctuating prices. • Medium sour crude is the main type of oil China and its neighboring countries import. • Medium sour crude oil accounts for over 40% of global crude output, but there is currently no price benchmark for it. • The supply/demand dynamics of medium sour are not the same as light sweet crude. • 1%, the government would need over $600 billion to pay the interest on its debt. • 2%, it would need over $800 billion. • 3%, it would need $1 trillion. • 4%, it would need over $1.2 trillion, or over half of what it currently snatches from taxpayers—again, just to pay the interest.